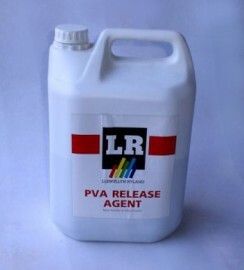 Polyvinyl Alcohol release agent for polyester resins. (not to be confused with PVA polyvinyl acetate adhesive). This blue liquid is sprayed or sponged onto the pattern prior to applying the gel coat. It forms a thin plastic skin that is not affected by styrene in the resin. It can be removed from finished laminates with warm water.